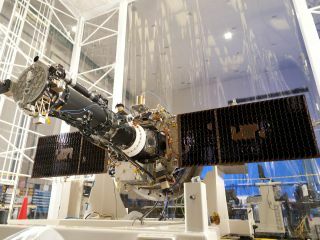 A power outage in California over the weekend has delayed launch preparations for NASA's newest sun-studying spacecraft by 24 hours, pushing the new solar observatory's blastoff to no earlier than Thursday (June 27), space agency officials said. The Interface Region Imaging Spectrograph satellite, or IRIS, was originally slated to lift off Wednesday (June 26) from California's Vandenberg Air Force Base. But the power went out for several hours at Vandenberg and other locations throughout the state's central coast Sunday night (June 23), affecting the base's key tracking and telemetry systems. This image shows technicians and engineers at Vandenberg Air Force Base in California connecting the Pegasus XL rocket with the Interface Region Imaging Spectrograph, or IRIS, solar observatory to the Orbital Sciences L-1011 carrier aircraft. This image was released June 19, 2013. As power was restored at Vandenberg, a fire broke out in an electrical switching box that feeds about five transformers at the base, officials said. The fire damaged an important part that now needs to be replaced before the tracking systems can come back online. "Once that piece is installed and we've tested it — and we've brought up all the range equipment, so we've gone through all the extensive testing and rehearsing that we need to do — we feel confident that we'll be able to support a Thursday evening launch," said Lt. Col. Burton Catledge, commander of the 2nd Range Operations Squadron at Vandenberg. IRIS will launch aboard a Pegasus XL rocket, which is built by the Virginia-based aerospace firm Orbital Sciences. A carrier aircraft will drop the Pegasus into the skies above Vandenberg, at which point the rocket's engines will kick on and send the spacecraft into Earth orbit. Once up there, IRIS will peer at a mysterious sliver of the sun between the solar surface and the corona, or outer atmosphere. Scientists are keen to understand this interface region, which is just 3,000 to 6,000 miles (4,800 to 9,600 kilometers) wide, because the immense energy flowing through it helps drive many aspects of space weather. IRIS is "going to look in closely, and it's going to look at that specific region to see how the changes in matter and energy occur in this region," Jim Hall, IRIS mission manager for the Launch Services Program at KSC, said in a statement. "It's going to collectively bring us a more complete view of the sun." Weather on Thursday is expected to be good; Air Force officials estimate just a 20 percent chance of a weather-related scrub.